A12 Rome-Civitavecchia exit Cerveteri-Ladispoli. In short you arrive at an intersection where you continue on the right, towards Ladispoli and SS1 Aurelia. With a short straight you reach a large roundabout with a tall lamp and turn right on the SS1 Aurelia, direction Civitavecchia-Grosseto, which runs exactly until Km47.200, where you turn right to Bracciano-Manziana-Sasso. Take the SP2 / c road up to the Km6 sign (at 153/155) and park in front of it, in a clearing on the right; or in an open space on the left, which acts as a driveway to the villa on the left, so be careful not to hinder the passage. Climbing a ruined gate, go to the end of the small field and for tracks to go right into the grove below. Leaving the grove, tracks downhill to the left lead to a kind of mule track, which goes downhill between a fence on the left and a ditch on the right. After the fence, turn right, go down into a ditch that is easily overcome and go up the slope from the opposite side. To reach the Saxon on the left with the sectors Torrione sud and Paretone, you must continue straight on the flat towards the forest. The track goes down as it enters the wood and then rises briefly through some boulders. On the right of a cave you can see the 1st Mal street on the right (20 minutes). Go uphill with easy climbing to the left until you reach a sort of amphitheater. Going down to the left you reach another equipped wall. Going down the path again, up to a few meters above the stream, you can see on the right, face downstream, at the lowest point of the wall, near a big tree, the attack of the route with more shots Immeasurable Prayer. If you do not have the mezzecorde at least a single 70m rope, 12 referrals and a minimum of 3 strings / straps to lengthen them, descenders. Drop in double on the left to a terrace and then up to the base of an earthy channel. From here follow the red and white ribbons on the trees and then the signs to return to the base of the road or to reach the saddle between the peaks. Withdraw: 1) 2) in double; 3) in double on the streets of the Paretone; 4) 5) 6) from the base of the shoots you reach a tree with a cordon, a few meters below a stop allows a 35m double to reach the base; 7) double at the base of the wall, for traces on the left you reach the tree with cordon; 8) double at the base of the wall, then cross to the right and reach a saddle. From there with a III channel you reach the marked trail; 9) with double to the same terrace reached by the descent of 10). Gear: The way is protected to fix and the stops are equipped with chains. Type: Volcanic, generally very good, but at some point you need to be careful. Mandatory helmet. Note: Smisurata Preghiera è il testamento spirituale di De Andrè e il nome che Roberto Iannilli ha voluto dare all'ultima via che ha chiuso. E' parso giusto a chi ha attrezzato dare questo nome a questa via lunga nella sua falesia di casa, che per primo ha valorizzato. La via, di circa 250 metri e 10 tiri, parte dal punto più basso della parete, appena sopra un torrente, e percorre in alto una panoramica cresta toccando sette piccole punte - si propone il toponimo I sette fratelli Cervi- Alla fine si trova un libro di vetta dove si può lasciare un ricordo. Logistic: Private property. 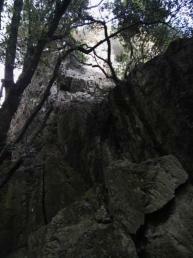 In the sectors Torrione sud and Paretone there does not seem to be any difficulty in climbing.